When it comes to enhancing the quality of life, a positive attitude is everything! I firmly believe that whatever you choose to concentrate on the most… you tend to bring into your life. This is true, whether by choice or - by circumstance. So why not focus on a positive attitude? By doing so, you enhance the quality of your life and the lives of others around you. It can be so easy to get into the habit of seeing doom and gloom in each and every situation. Almost all of us are in the habit of talking down to ourselves, which leaves us feeling hopeless, discouraged and negative. However, when you do that...it keeps you forever focused entirely on the negative. Have you ever known someone who had a terrible attitude? Perhaps they were extremely negative, pessimistic and not much fun to be with. They complained non-stop about how terrible their life was. Didn’t you find it draining to remain in their presence? 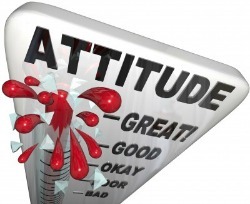 A negative attitude will not only make you miserable, but everyone surrounding you too! A positive attitude, on the other hand, makes everyone enjoy being with you. You are a person that constantly experiences great things, and a person who loves their life! The more you put it into practice the more you’ll believe it, plus the more you’ll continue to experience just that. · Make a concentrated effort to do what you love. This applies to hobbies and fun activities, and it also pertains to one of the biggest parts of your life - your work! Do you enjoy your work? Are you spending most of your time on something which allows you to feel purposeful and fulfilled? If not, consider exploring other career options and moving toward an occupation you’ll love. When you frequently do things which give you happiness, you can’t help but feel happier about yourself and your life. This promotes a positive attitude. Think and talk positively to and about yourself every day. Get into the habit of building yourself up with positive self-talk and positive thoughts. Validate your good qualities and downplay your unfavorable characteristics. Even when things are not going well for you, show that you are a work in progress. You may not perfect…but terrific nonetheless. Keep building yourself up, and keep a great attitude!